The Canadian International Development Agency has abruptly pulled partisan letters from its website after NDP Leader Tom Mulcair blasted the published correspondence as "highly partisan" and a breach of federal rules. One of the letters, titled "Dear NDP: CIDA Does Not Need Your Economic Advice," was dated Dec. 21, 2012, and signed by Minister Julian Fantino. It was penned in response to an article NDP critic Hélène Laverdière wrote for the Huffington Post. 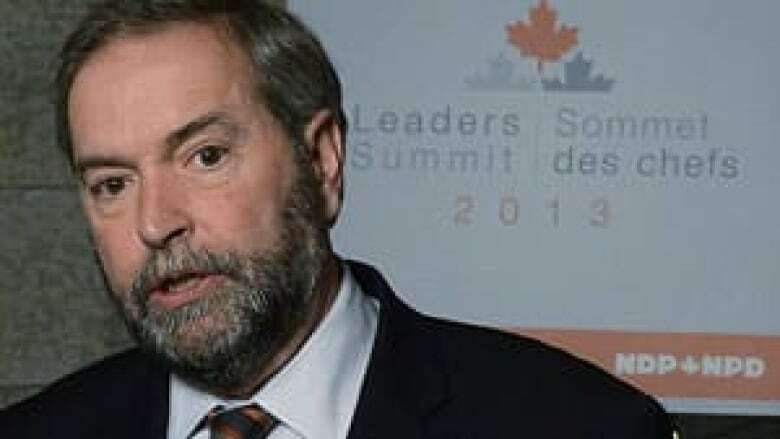 "I find it ironic that the NDP, a party that wishes to impose a $21-billion carbon tax on Canadians and more than $50 billion in radical spending measures while we face global economic uncertainty, now wants to give advice to developing countries on their economic development," the letter reads, after accusing the NDP of taking "their reckless economic sideshow to the developing world." The letter goes on to outline work and positive results the Conservatives have achieved on the CIDA file. Another letter took the Liberals to task and contrasted their policies with those of the Conservatives. Addressing the issue on CBC News Network’s Power & Politics, Mulcair called the letter critical of the NDP a "clear violation of the rules." "I’ve never seen that in my life — that a minister would use government property for a partisan political attack," he told host Evan Solomon. According to Treasury Board rules, government departments must inform the public about policies, programs, services and initiatives in an "accountable, non-partisan fashion consistent with the principles of Canadian parliamentary democracy and ministerial responsibility." A spokeswoman for Fantino said posting the letter was a mistake. "CIDA was asked to add appropriate web content and these were posted in error. CIDA has been asked to remove them immediately," Meagan Murdoch wrote in an emailed statement to CBC News. Mulcair also called the Conservative government’s decision to freeze future funding to Haiti pending a full review a "tragic mistake" and a "heartless approach." "Take care of the money, follow the money, be there, have more people following it — but don’t punish the people who need the help right now. That’s a terrible approach," he told Solomon about aid to the island nation still recovering from a devastating earthquake three years ago. Mulcair was hosting his provincial leader counterparts in Ottawa Tuesday to discuss policy and ways to build the NDP’s support in Western Canada. "Anything else is going to have to go through Parliament. There’s been no request for a special debate on that so far," he said.